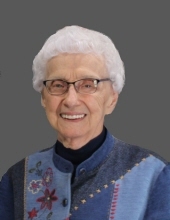 Dolores "Toni" Boeke, age 93, of Hubbard, IA, passed away on Wednesday, January 2, 2019 at Hubbard Care Center. Dolores Anita (Martin) “Toni” Boeke was born on October 12, 1925 in the family home in Fort Atkinson, Iowa. She was one of five children born to John and Agnes (Winter) Martin. She grew up on the family farm west of Fort Atkinson, Iowa. She received her education at the St. John’s Parochial School through the 8th grade and graduated from the Fort Atkinson High School. She enrolled in the Nursing Cadet Program at the University of Iowa in Iowa City and graduated as registered nurse. While working in the hospital wards, she met Jack Boeke who also worked at the U of I Hospital. She and Jack began to date and on February 11, 1950 they were united in marriage at St Thomas Moore Catholic Church in Iowa City, Iowa. When they completed their internships, they moved to Jack’s hometown of Hubbard, Iowa. Here they joined the family business, HS Boeke and Son. Additionally, Toni worked as a nurse at the Eldora and Story City Hospitals. Toni also helped with the funeral business until she moved to the Hubbard Care Center in 2017. She and Jack raised three boys together, Steve, Dennis and Mark. Toni was an intelligent woman of strength, who spoke her mind. She had a great, witty sense of humor. She loved to spend time with her grandchildren and they loved to spend time with her. She and Jack were strong supporters of their community. She had a passion for playing bridge with her friends at bridge clubs in Hubbard and surrounding communities. She will be greatly missed by all. Toni passed away at the Hubbard Care Center on January 2, 2019. Toni is survived by her sons Steve and his wife Julie of Waterloo, Iowa, Dennis and his wife Donna of Stockton, Missouri and Mark and his wife Kathy of Hubbard, Iowa; six grandsons, Jacob Boeke, Scott and Lauren Boeke, Paul and Missy Boeke, Joseph Boeke and Ally, Seth Boeke, Ryan Boeke and one granddaughter Emily Boeke; three great-grandchildren; and one sister Leona Sloan of Iowa City, IA; along with many nieces and nephews, step grandchildren and friends. Toni was preceded in death by her parents John and Agnes Martin, husband Jack Boeke, one sister Lucille Wiggins and two brothers Raymond Martin and Leo Martin. After assisting with so many funerals over the 60+ years, we’re sure she is glad that this is the last one she has to be involved with. In lieu of flowers memorial contributions may be directed to the family for a memorial fund to be established. Boeke Funeral Home of Hubbard is taking care of the family. To send flowers or a remembrance gift to the family of Dolores "Toni" Boeke, please visit our Tribute Store. "Email Address" would like to share the life celebration of Dolores "Toni" Boeke. Click on the "link" to go to share a favorite memory or leave a condolence message for the family.